ETERNAL LIFE: CAN IT REALLY BE MINE? 1. Do you have a sincere desire to serve and please God? 2. Do you know for certain that you will spend eternity with God? If you are not sure, please take the time to read on. The Bible does say, “These things have I written unto you that you may know that you have eternal life” (1 John 5:13). God created people to honor, serve and fellowship with Him. The Bible says, “Thou art worthy, O Lord, to receive glory and honor and power: for Thou hast created all things, and for thy pleasure they are and were created” (Revelation 4:11). “Whether therefore ye eat, or drink, or whatsoever ye do, do all to the glory of God” (1 Corinthians 10:31). “Thou wilt show me the path of life: in Thy presence is fullness of joy: at thy right hand there are pleasures forevermore” (Psalms 16:11). If God’s purpose for mankind is to honor, serve, and fellowship with Him, then what happened that destroyed this perfect relationship? The Bible says, “For the wages of sin is death, but the gift of God is eternal life through Jesus Christ our Lord” (Romans 6:23). When man chose to disobey God, the result was death, or a separation from Him. This translates into the death of a relationship and lack of spiritual communion with the Creator. It also resulted in a barrier or gulf between God and man. 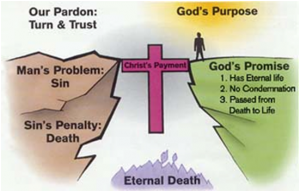 The Bible teaches that there are three types of death or separation, which result from sin. Spiritual death separates a person from the life of God (Ephesians 2:1). 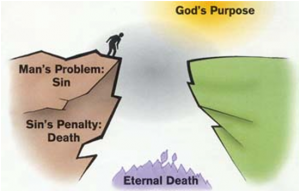 Physical death separates a person’s soul from his or her body (Hebrews 9:27). Eternal death separates a person, both soul and body, from God forever in Hell (Revelation 20:15). Our Attempt To Solve the Problem: We try to solve it on our own merit. Throughout history individuals have tried many ways to earn eternal life, but every attempt has been unsuccessful. The Bible says, “There is a way that seems right unto man, but the end thereof is the way of death” (Proverbs 14:12). “Not by works of righteousness which we have done, but according to His mercy He saved us” (Titus 3:5a). “For by grace are ye saved through faith; and that not of yourselves; it is a gift of God: Not of works, lest any man should boast” (Ephesians 2:8 & 9). This is where most people find themselves – trying or pretending to be good enough. Please note that even church membership, baptism or any kind of good deed does not merit God’s favor. This is the time to review your answer to God’s question: “Why should I let you into heaven?” If you are like most people, you will have listed the things that you have done to, hopefully, earn eternal life. Perhaps you are simply trying to be a good person. Please recognize that this is the human perspective and not God’s solution. God has solved this problem in the person of His Son, Jesus Christ – God’s sinless Son, who was sent by the Father to pay the penalty for our sins by dying on the cross in our place. The Bible says, “But God commendeth His love toward us, in that, while we were yet sinners, Christ died for us” (Romans 5:8). “For Christ also hath once suffered for sins, the just for the unjust, that He might bring us to God” (1 Peter 3:18a). “For He hath made Him to be sin for us, who knew no sin, that we might be made the righteousness of God in Him” (2 Corinthians 5:21). “All we like sheep have gone astray; We have turned everyone to his own way, and the Lord hath laid on Him the iniquity of us all” (Isaiah 53:6). 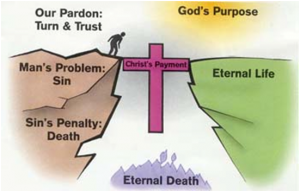 How do we claim the pardon for our sin and receive the gift of eternal life? We must receive Jesus Christ as our Lord and Savior. Jesus said, “I am the way, the truth, and the life: no man cometh unto the Father but by me” (John 14:6). To receive Jesus as Lord and Savior, you must stop trusting in what you have done, repent or turn from your sin and put your trust in Jesus alone as the only hope for eternal life. Those who think they are Christians because of church affiliation or various acts they performed in order to become a Christian, are actually not “children of God” because they have mixed their own good works into the equation. The Bible says, “Repent ye therefore, and be converted, that your sins may be blotted out” (Acts 3:19a). “Believe on the Lord Jesus Christ and thou shalt be saved” (Acts 16:31a). “For whosoever shall call on the name of the Lord Jesus Christ shall be saved” (Romans 10:13). Jesus says, “Come unto me all ye who are heavy laden and I will give you rest” (Matthew 11:28). Christianity is the only faith that says, “Come.” All others say, “Do something to possibly earn eternal life.” Jesus is waiting for you to come to Him. “If thou shall confess with thy mouth the Lord Jesus, and shall believe in thine heart that God has raised Him from the dead, thou shall be saved” (Romans 10:9). Jesus not only paid the penalty for your sin, but He rose from the dead and now sits at the right hand of the Father where He intercedes for all believers. This is the place where many people stop. It is very easy to allow pride to hinder your thought process here. If you sense no leading of God right now, please pray that you will. But for you who sense God’s moving of your heart, ask yourself – have the Scriptures above drawn you and do you see yourself in need of a relationship with your Creator? If so, then God is speaking to your inner being as a loving Father calling to a wayward child. Do not put off His calling for He will not call on you forever. Jesus Christ said, “Verily, verily, I say unto you, he that heareth My word, and believeth on Him that sent Me, hath everlasting life, and shall not come into condemnation; but is passed from death unto life” (John 5:24). Will you receive Jesus as Lord and Savior today? To do so you must pray to God: 1.) 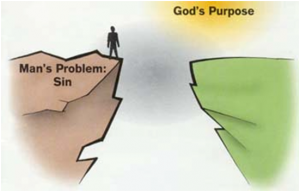 Admit that you have sinned against God, be willing to turn from this sin and ask Him for forgiveness. 2.) Believe that Jesus is the Son of God Who died for you on the cross to pay the penalty for your sin and to purchase a place for you in heaven. He then rose from the grave and conquered sin and death on your behalf. 3.) Call upon the Lord Jesus Christ to save you and give you eternal life. If you have prayed these things without reservation, you can be sure that you are part of the “Family of God.” It is important that you understand the principles of a blessed Christian life. We would love to help you to experience the most that God has for you.